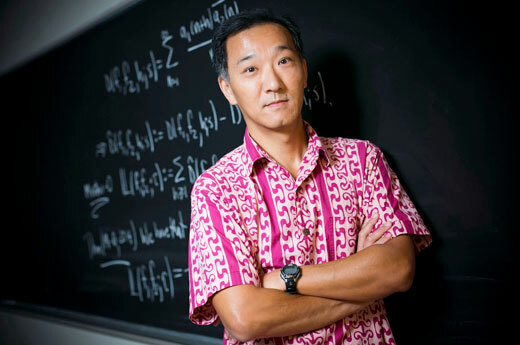 Much of the work of number theorist Ken Ono involves solving long-standing mysteries stemming from the work of Indian math genius Srinivasa Ramanujan. Emory Photo/Video. Cast your vote for "Mother Lode of Mathematical Identities" to qualify for Discover Magazine’s “People’s Choice” for top science story of 2014. An Emory math breakthrough, “Mother Lode of Mathematical Identities,” is down to the final two in voting for Discover Magazine’s “People’s Choice” for top science story of 2014. The final round will continue through December 24. Cast your vote. The editors of Discover Magazine sifted through all their science stories of the year and selected the 100 most important ones for 2014. They ranked the find by Emory mathematician Ken Ono and collaborators 15th. Since the magazine opened up these stories for “People’s Choice” voting in November, the math breakthrough has kept moving up in the rankings. Last summer, Ono and his collaborators Michael Griffin and Ole Warnaar found a framework for the celebrated Rogers-Ramanujan identities and their arithmetic properties, yielding a treasure trove of algebraic numbers and formulas to access them. "Ole found this huge vein of gold, and we then figured out a way to mine the gold," Ono said of the discovery. "We went to work and showed how to come full circle and make use of the formulas. Now we can extract infinitely any functions whose values are these beautiful algebraic numbers." In the people’s choice awards, the math discovery is vying against stories of cosmic inflation, cybersecurity leaks, the collapse of the West Antarctic ice sheet, the battle against the Ebola outbreak, the genomes of the first Americans, entangled photons and the Rosetta spacecraft’s rendezvous with a comet. It was another big year for science news, showcasing a wide range of disciplines. In fact, one of the only things all of these science advances have in common is their reliance on math.